If you’ve been using your bread machine to bake bread you’ve no doubt discovered the range and breadth of great breads you can make. But you don’t have to go through the whole baking cycle with your bread machine. You can remove the dough after the kneading and/or first rise and do some very creative and wonderful things. 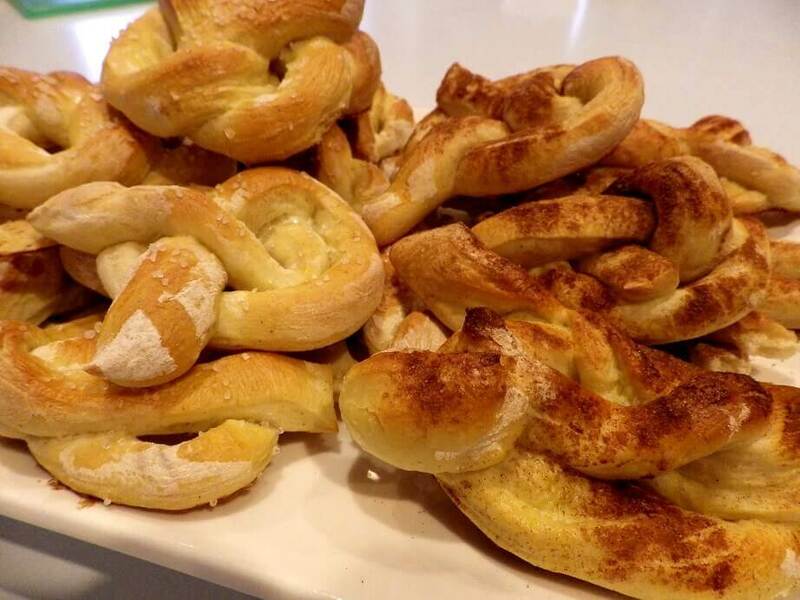 You can make dinner rolls, long French bread loafs, hamburger and hot dog buns, pretzels, pizza, even Holiday favorites like braided Challah bread. The great thing about a bread machine is that it easily handles one of the most tedious and critical steps in bread making: kneading the dough. If you’ve ever made bread by hand you know that the kneading process is both physically demanding and time consuming. 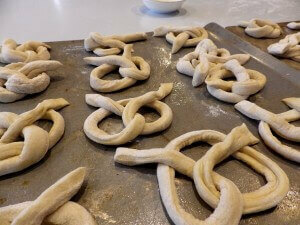 It’s also a bit of mess as you continue to dust with flour to keep the dough from sticking to your hands. Your bread machine makes this process easy. What you need to know is when the kneading process and rising process is complete. Sometimes there are audible beeps and most times there will be a cycle or setting on your brad machine for dough only. Once your dough is kneaded you can either let it rise in the machine or take it out to manage the rise yourself. 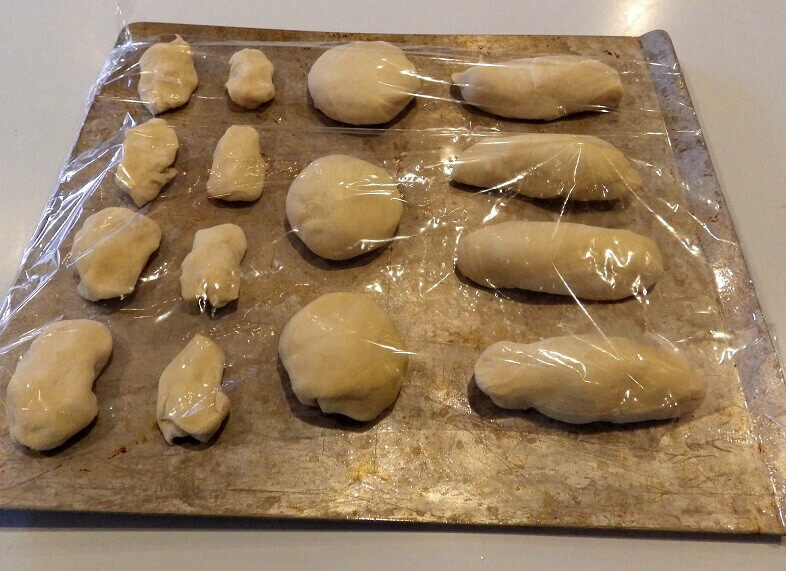 The best way to allow any dough to rise once it’s out of the machine is to cover is with some plastic wrap on a baking tray and let it rest for 30 to 40 minutes. 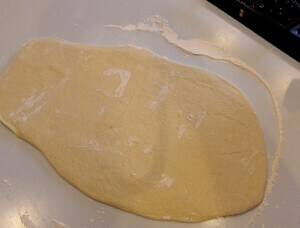 But before you let your dough rise for the first or second time you need to work it into the shape you want. Once you have your dough-ball in hand you need to consider what you are going to bake in your oven. 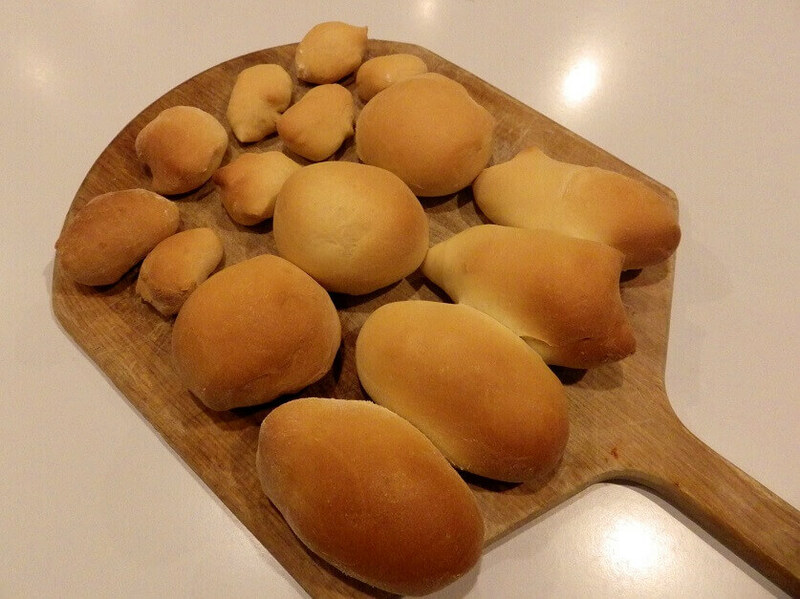 The recipes sometimes vary so you may already have an idea, but many basic rolls and buns use the same fundamental recipe. If you’re making hamburger buns you’ll want to cut off a piece of dough and shape it into a bun shape. You do this by folding the dough under itself until your have a piece of dough that resembles a bun. Remember, it will rise to 2 or 3 times its size. You can use the same approach with less dough to make dinner rolls. If you are making a hot dog bun for a hot dog or sausage you’ll want to pull the dough into a long shape and again fold it under itself until it resembles a long, bun shape. This too will rise to 2 to 3 times its original size. 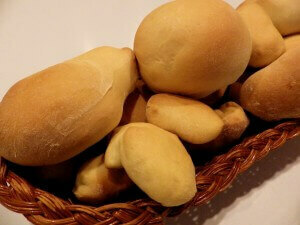 French bread is traditionally long and thin. Roll the dough ball with two hands into a tube shape and pull it into shape with the dough distributed as evenly as possible across the loaf and let rise. You can top any of the rolls, buns or loaves with sesame seeds, poppy seeds or other toppings such as cheese or grilled onions. This is something that’s a bit difficult to do in a bread machine. Pizza dough is easy and obvious. 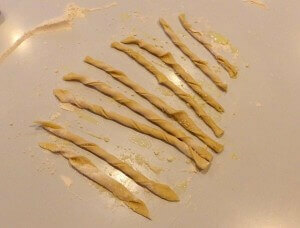 Just roll out the dough with a dusted rolling pin and pull into shape. I’ll often make a double or triple batch of pizza dough to have on hand. It keeps in the refrigerator up to a week if it’s wrapped in plastic wrap. If you want to whip up a pizza just cut off a chunk of dough, but let it rest for about 30 to 40 minutes until it gets up to room temperature and rises a bit. If you roll out the dough when it’s still cold it will continue to contract to a smaller size no matter how much you roll and stretch it. Put it on a baking sheet dusted with corn meal or sprayed with a vegetable oil spray and you’re ready to top it. 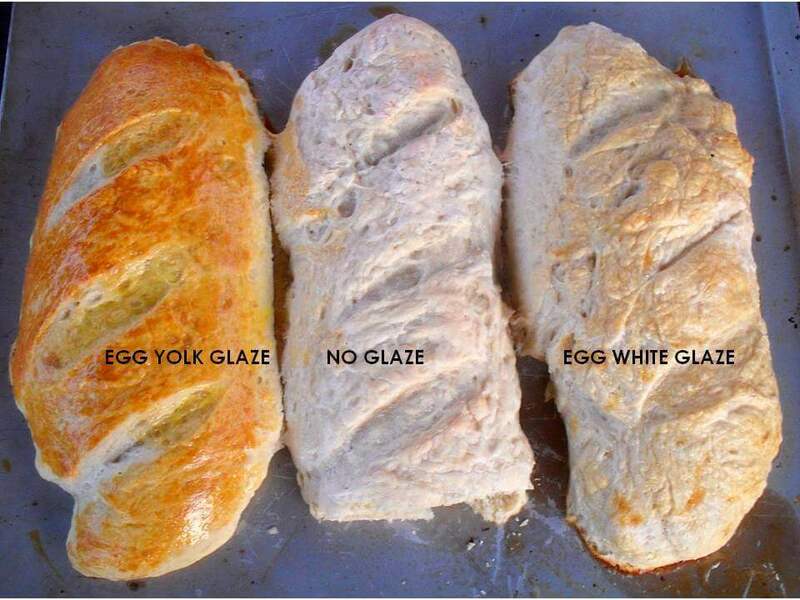 Something else that people like about shaping and baking their bread in the oven is the various shapes they can achieve. Many bread machines produce a tall, vertical loaf. 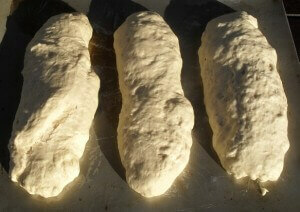 Just as many leave a hole in the bottom where the kneading paddles have baked into the finished bread. If you want to control the size and shape of your loaf, the dough cycle is the way to go. You could even take your dough ball and stretch it into a traditional bread pan and bake that in the oven if you want the traditional loaf shape you get at a grocery store. 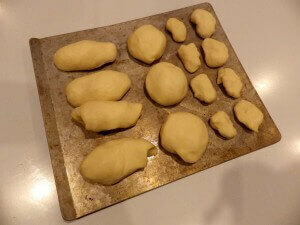 Select the Dough course or remove the dough before the baking cycle begins for any of the other courses. 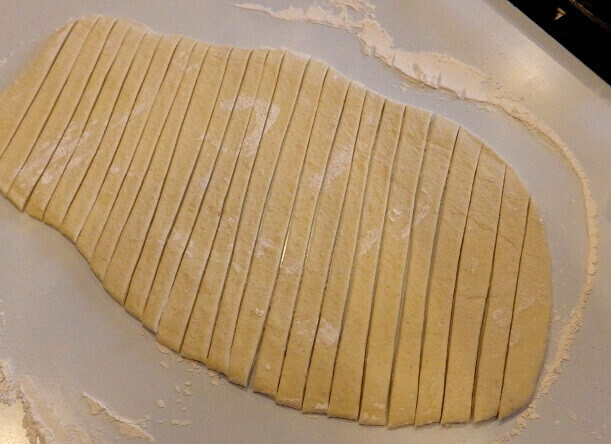 Shape the dough on a baking pan into an elongated shape and cover with plastic wrap. Let rise for 30 to 40 minutes. Cut diagonal slits in the top and glaze with 2 tablespoons of water and 1/2 teaspoon of salt. In an oven preheated to 400°F/205°C bake for 20 to 25 minutes until the top turns a golden brown. For bread sticks, roll out the dough on a flour dusted surface into a 14″ square. 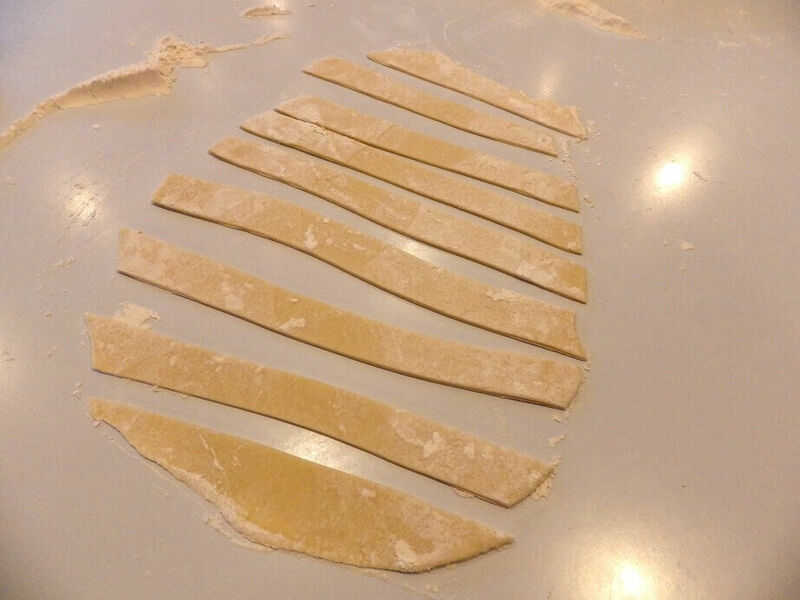 Cut the dough into 18 long strips. Brush with melted butter and a sprinkle of parmesan cheese if you like. Twist the strips a few times and let rise on a baking sheet covered with plastic wrap for 25 to 30 minutes. Removed the plastic wrap and bake at 400°F/205°C for 12 to 15 minutes or until golden brown. 1 egg at room temperature plus enough water to equal 1 1/3 cups. Water should be at 80°F/27°C. Select dough course. Once the dough cycle is complete place on a lightly floured surface and cut into 24 equal pieces for dinner rolls, or 12 equal pieces for buns. Shape into either a long, bun shape for hot dogs or a round shape for hamburgers. Dinner rolls can be slightly elongated similar to an egg shape. 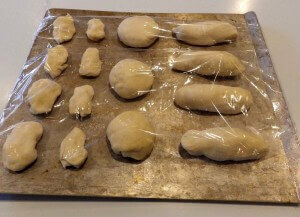 Cover the shaped dough with plastic wrap and let rise for 30 to 40 minutes. Preheat oven to 350°F/177°C and bake for 12 to 25 minutes until golden brown. 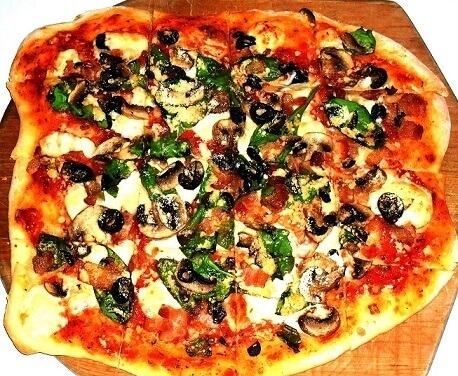 Select Pizza Dough Course or the basic dough course. When cycle is complete place on a lightly floured surface. 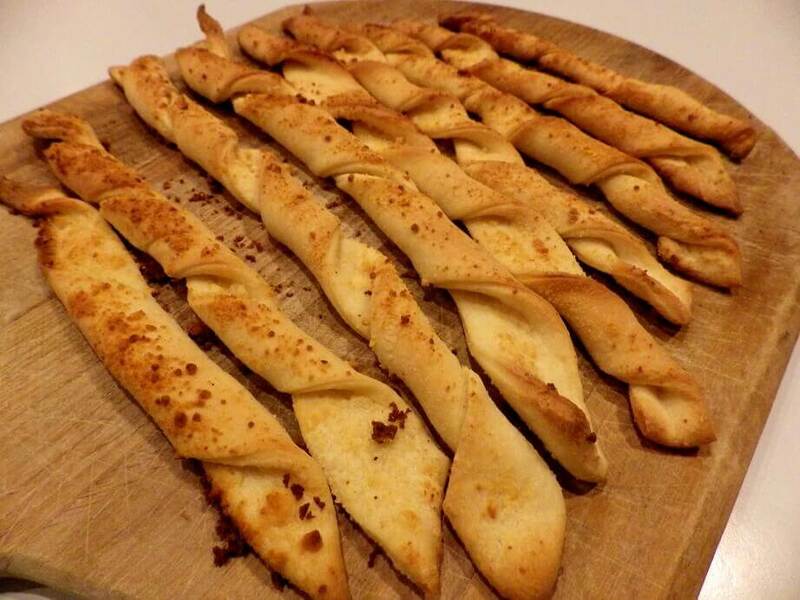 If making two thin crusts, divided in half. For one thick crust begin to roll out the dough with a flour dusted rolling pin and push and pull dough into shape raising the edges. Spread a pizza sauce over the top (this could be as simple as a canned tomato sauce) and sprinkle with your toppings. Bake in a preheated oven set at 425°F/218°C for 20 minutes or until crust is a golden brown. You can top your pizza with just about anything so experiment and have fun. 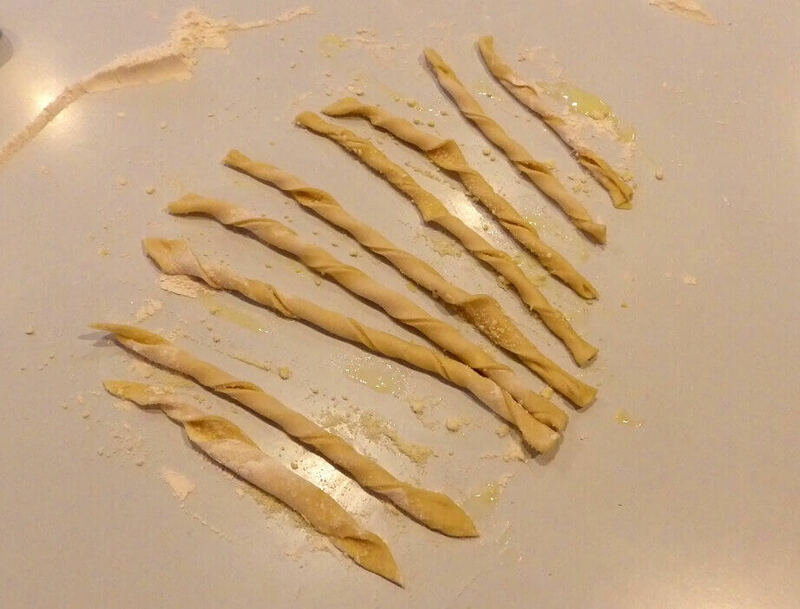 Select dough course. When dough cycle is complete remove dough to a lightly floured surface and cut dough into 16 equal pieces. 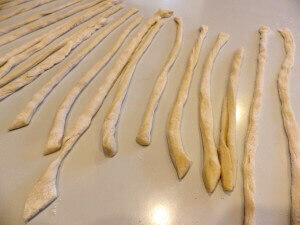 Roll each piece with both hands to form a 16-inch rope of dough. 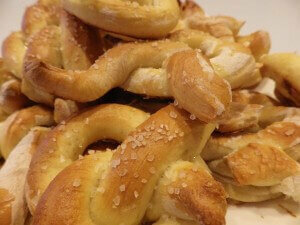 Fold the dough into a pretzel shape. To do this, cross the ends of the rope to make a loop and twist the crossed ends once and fold across the loop. 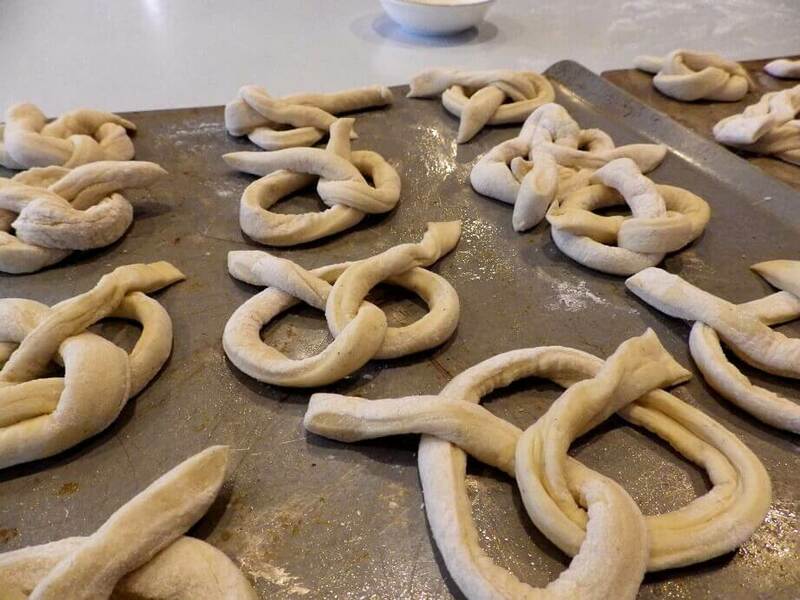 You might have to practice a bit, but when you get the pretzel shape you’ll recognize it. Place on a greased baking sheet and brush with a glaze of 1 egg white and 1 tbsp of water beaten together. Top with coarse sea salt and/or parmesan cheese or whatever toppings you like. Bake in a preheated oven at 375°F/190°C for 15 to 20 minutes or until browned. 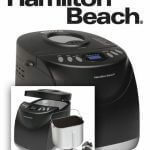 I have a new Hamilton Beach bread maker….and I want to make Sourdough buns. 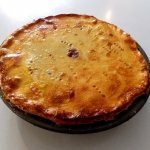 I used the dough setting – but none of the recipes I can find say how many times I need to let the dough rise! One? (does it do that in the bread machine on the dough cycle?) or two? (after I take it out of the machine and form it into buns?) Help!! I have been working this out for my Black and Decker and probably by now you have an answer. I think the dough cycle is the same on all the machines –the dough is ready for the first rise to begin when you take it out of the machine. I have worked. things out for my B&D for the whole grain setting so that I can remove the dough, take the paddle out, and return the dough to the machine so that it can have a final rise and bake. I don’t want to turn the oven on for just one loaf of bread. toby. I have been working this out for my Black and Decker . I have an All in One Plus but most likely it’s the same for all their bread machines. I like to let the machine do all the work, and then remove the paddle and replace the dough in the baking pan before the oven turns on. I did this for the multigrain setting which has a longer kneading and mixing cycle. At 2-1/2 hours I can remove the dough, pat it into a nice shape to cover where the paddle had been, and replace the dough [leaving the machine on of course] so it’s ready to bake. I am not sure about basic breads or sweet breads which I assume would be the same. The multigrain cycle is 20 minutes longer so maybe at 2 hours and 10 minutes I can take the paddle out of basic breads. The bread bakes beautifully in the B&D machine when the paddle is removed. New to using my Breadman only a few times and after filling our house with the fresh baked bread which 4 ladies say tastes great my low sugar diet Grape they wanted more! I’ll try some of these breads on this page… Mahalos! I have a Hamilton Beach bread machine and I use the dough cycle for my breads. The first couple of times I used it, the bread rose beautifully, but ever since, it has started kneading the dough again halfway through the rise! I assume this isn’t normal, and maybe just a glitch in my machine? My bread hardly rises now and always turns out like a brick. Any thoughts? For the dinner roll/hamburger bun recipe, is that 1/4 TBS of oil?